Read excerpts at Helen Hollick’s website. The Sea Witch Chronicles — (2006- ) Publisher: The time: the golden age of piracy, 1716. The Place: the Pirate Round from South Africa to the Islands of the Caribbean. Escaping the bullying of his elder brother, from the age of fifteen Jesamiah Acorne has been a pirate, with only two loves — his ship and his freedom. But his life is to change when he and his crew unsuccessfully attack a merchant ship off the coast of South Africa. He is to meet Tiola Oldstagh, an insignificant girl or so he thinks — until she rescues him from a vicious attack, and almost certain death, by pirate hunters. And then he discovers what she really is; a healer and a midwife — and a white witch. Her name, an anagram of “all that is good.” Jesamiah and Tiola become lovers, despite her guardian, Jenna Pendeen’s disapproval, but Stefan van Overstratten a Cape Town Dutchman, also wants Tiola as his wife, and Jesamiah’s half brother Phillipe Mereno, is determined to seek revenge for a stolen ship and the insult of being cuckolded. 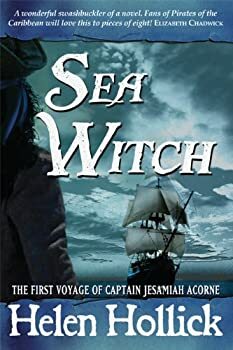 When the call of the sea and an opportunity to commandeer a beautiful ship, Sea Witch — is put in Jesamiah’s path, he must make a choice between his life as a pirate or his love for Tiola; he wants both — but Mereno and Von Overstratten want him dead. In trouble, imprisoned in the darkness and stench that is the lowest part of his brother’s ship, can Tiola with her Craft, and the aid of Roux, Jesamiah’s quartermaster and the rest of his loyal crew, save her pirate? And can she keep Jesamiah safe from another who wants him for herself? From the elemental being that is Tethys, Goddess of the Sea? A charismatic pirate rogue and a white witch — what better combination for a story of romance and high-sea fantasy adventure? CLICK HERE FOR MORE SEA WITCH STORIES. I really enjoyed Helen Hollick's trilogy about King Arthur, and I love pirates, so I had very high hopes for this historical fantasy. Therefore, I was extremely disappointed that I couldn't even get past chapter five of Sea Witch. The story and the characters seemed promising, and I know from past experience that Ms. Hollick tells a good tale, but the writing was so badly done that I couldn't continue. I had to keep re-reading paragraphs in order to understand what was going on. It's not that I don't understand nautical language — I have read and loved all 21 of Patrick O'Brien's Master and Commander series. Rather, horribly constructed sentences completely distracted me from the story. Pendragon’s banner — (1995-1997) Historical fantasy. Publisher: A novel of Arthur as he really was. In the first book of this exciting trilogy, author Helen Hollick brings to life Arthur Pendragon as he really might have been. Leaving behind the fairy-tale element of Merlin’s magic and the improbable existence of Lancelot, Hollick instead transports the reader to the early years of Britain circa 455 AD and tells the Arthurian legend in a solid and believable way. For one, Arthur does not pull a sword from a stone using superhuman strength; rather, he is named heir to Britain (if he can win it from the tyrant Vortigern) while standing near a “hallowed stone, the symbol of a warrior’s strength and the chieftain’s right of leadership.” Later, a sword won in battle signals his place as Britain’s King. This is a story of harsh battles, secret treasonous plots, and the life-threatening politics of the dark ages of early Britain. Intertwined through it all is the often-tested love of Arthur and Gwenhwyfar (Guinevere in Welsh — her name as it really would have been) as they struggle to survive and conquer to see Pendragon become King. CLICK HERE FOR MORE BOOKS BY HELEN HOLLICK.